Murmurings from the large audience hushed as a clear and open darkness dropped over our outdoor theatre. The silence was far from absolute though as a breeze swept nearby leaves into a quiet song, a gentle lapping of water, and eventually the sweet notes of a string instrument drifting up from the distant water as the show began. My favorite scene from the light show; I love the simple beauty of the illuminated figures on the Li River and the striking white light on the distant limestone rocks in Yangshuo, China. The boats paddled out from the edges of our riverside theatre and colored floodlights illuminated the distant limestone mountains in a myriad of primary colors accompanying the mood of the story. 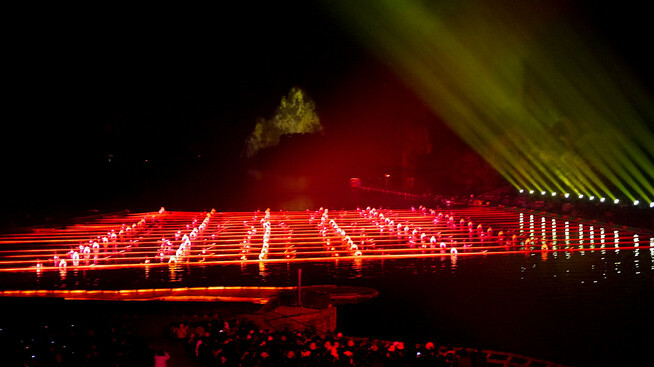 Back in 2008, I somehow missed the elaborate light shows designed for the opening and closing ceremonies of the Beijing Olympics but the shows wowed my traveling companions back then and they instantly recognized the name of director Zhang Yimou, who used his hometown region of Yangshuo as the backdrop for a new but similarly crafted permanent show. 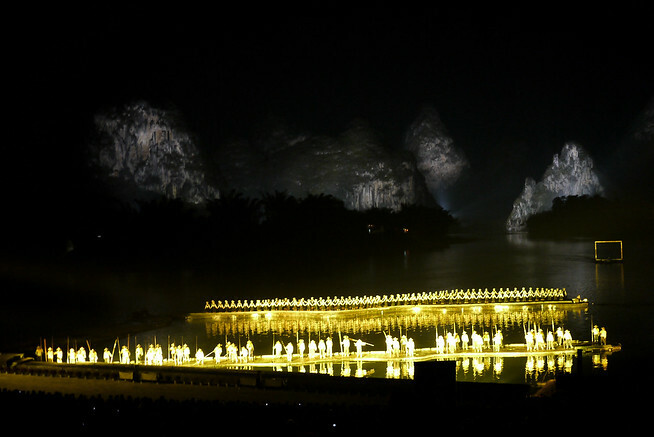 The Impression Liu Sanjie light show is one of those much-touted events for travelers to Yangshuo; even if my friends hadn’t known about the light show, the touts and sales agents in the town’s center made sure we had plenty of brochures in our hands! We debated the cost versus experience and decided to spring for the comparatively pricey tickets and welcomed the opportunity to see one of director Yimou’s signature shows live and in its intended environment. Dramatic fire and beating drums up the tension as the story plays out in Yangshuo, China. I fell in love with the outdoor aspect to the experience. The ancient Greeks had it right all along, epic performances of love, comedy, and tragedy should transpire on open stages and limitless roofs. Music drifted from the show into the heavens and a misty moonlight penetrated the dense sky, mixing with lights from the show and spreading into the forested areas that made up the “back” of our theatre. The show is pretty; the music haunting as it drifted across the water and washed over the stair-step rows of intent faces watching the performance. The story moved through different phases from folk music to traditional dancing and, at times, the sheer spectacle of perfectly timed and choreographed lights and rhythms captivated my imagination even though the entire story was relayed in Chinese (a language very distant from anything I comprehend). Huge ribbons of red fabric span the river as the actors stand on personal, tiny boats to create captivating rhythmic patterns to compliment the story while using the vast open sky for light patterns and entertainment. The show is gorgeous and I alternated between fascination and open anticipation. 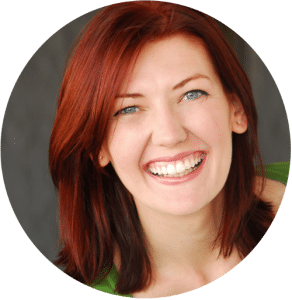 There were a couple of moments that fell flat from my expectations…perhaps I set the bar too high after hearing so many stories exulting the director’s past shows and skills. But I enjoyed the evening and the experience of watching a performance that harmonizes the unpredictability of nature with human beings. Even in less-than-ideal weather, the performers embrace the elements and augment the experience with whatever nature happens to conjure up–be it wind, mist, or rain– for that performance. 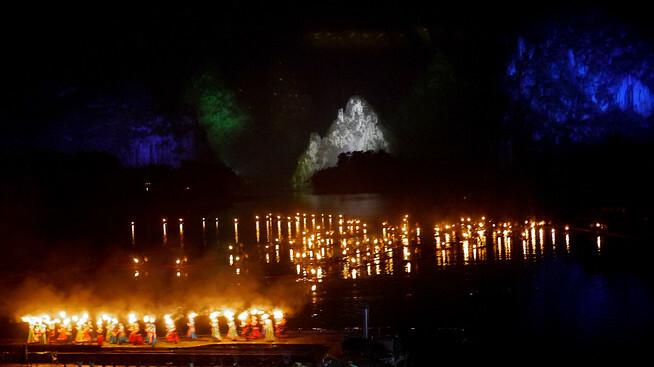 What: A beautiful display of lights and story set on the Li River; more than 600 actors tell the love story over the course of 60+ minutes of music, dance, and theatrical displays. 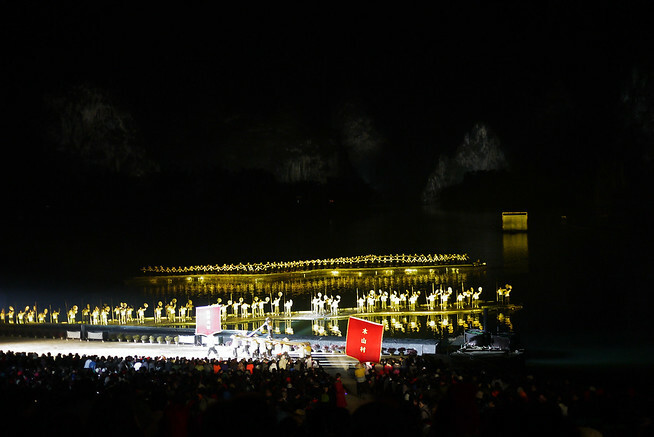 Show designed by director Zhang Yimou. Where: Likely your hotel or the company you book the tickets through will arrange your transportation to the entrance. The light show venue is very near the Yangshuo city center but requires transportation and outside coordination. How much: Roughly US $30 (RMB 198) for general seating. Extra Tips: Bring gear to combat the weather. I visited in the early Spring (last week of March) and was grateful to have my warm jacket and a rain poncho on hand! Hi! 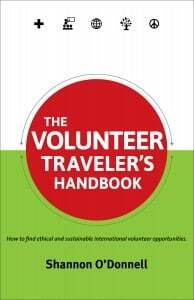 Your blog is amazing, one of the best travel sites I have ever seen! 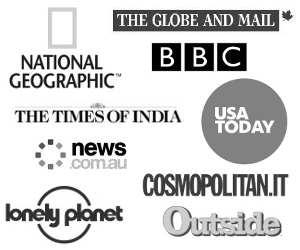 Thanks for sharing all this stuff with us! Nice job photographing this- night shots are really tricky! Looks like a neat experience. Wow – looks amazing! And even more amazing – a mere US$30! I mean, from the looks of it, you’d pay more than a C note in Vegas/NYC, etc. for such. Glad that you chose to go for it – no doubt you’ll have those memories for a lifetime!